Redefining style, innovation and panache in the Ghanaian Fashion industry, Debonair Afrik in conjunction with the Mercedes Benz Fashion Festival bring you Style Lounge 2016 Theme ; THE FASHION –BIZ . STYLE LOUNGE 2016 is an initiative that introduces fashion enthusiasts and students to cutting edge new innovations, technologies, subject matter experts and all round progressive fashion know-how. It is a one day event package that includes one fashion & style workshop and a networking moment . The primary goal of the STYLE LOUNGE is to shine a spotlight on the emerging trends in the fashion industry and provide participants with refreshing view of fashion blending the local Ghanaian fashion style trends while maintaining the highest international standards of fashion. The STYLE LOUNGE 2016 will work to create a fun and learning experience that is productive, valuable and inspiring. 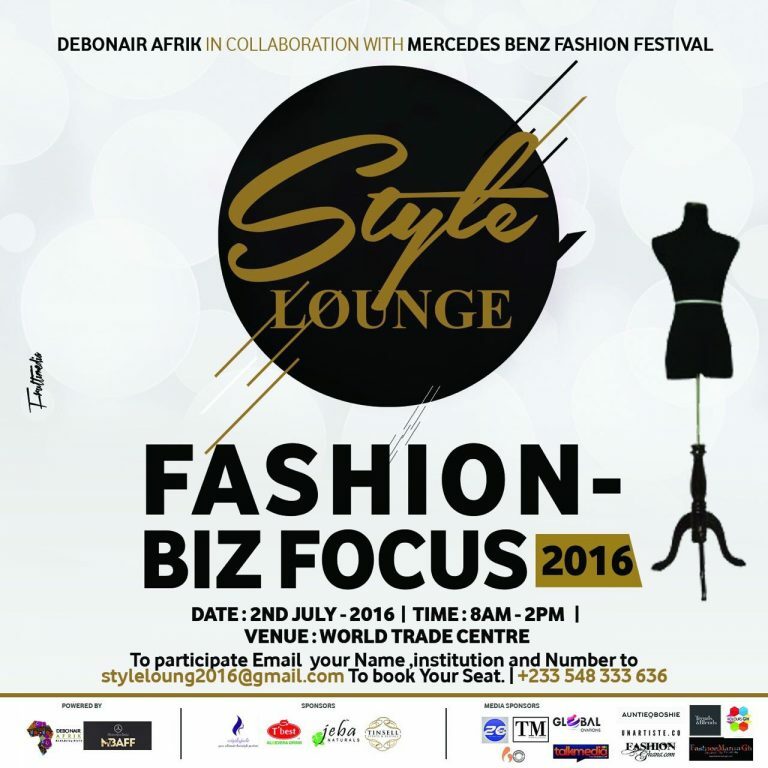 Style Lounge 2016 Will Take Place On The 2-July -2016 At The World Trade Center In Accra To Commence The Fashion Week .This Event Is Proudly Sponsored By T-Best Company ,Wigs By Jade , Tinsel Events And Jeba Cosmetics. Patrons who wishes to partake in the workshop individually or as a group should kindly email names and institution to stylelounge2016@gmail.com to book a free seat at the event. This intensive full day workshop will engage its participants in informational sessions and hands on activities which will draw on the concept of the personal wardrobe within which various styles, brands and materials are brought together. It also aims to encourage and develop the activities of small enterprises run by fashion entrepreneurs and draw the attention of leaders to the importance of the role of fashion industry in the Ghana’s economic and cultural development.